As a few other ideas have alluded to but not explicitly asked for is the ability to download single tracks from an music album and download albums as a whole from one SKU. We have started to use the Unsigned theme as the basis to create an artists and record label websites at the moment and are very excited how far we can take this new theme. The functionality it offers just about covers every possible need we have except for the ability to easily set up a method to sell individual tracks from an album or an album as a whole using Woo Commerce. We guess this could be done using some kind of table, with a play button (to play sample in JPlayer add on) for each track followed by the track name, price then a add and minus button to add tracks individually to the basket. You would also have a option at the top of the table to add the whole album (so adding all tracks at once) to the cart. Some kind of dynamic pricing can then be used to make buying the album as a whole cheaper then buying individual tracks. Last of all from this idea would be to dynamically compile a .zip (or similar) of all the tracks that had been bought and the ability for the customer to go into my account & downloads and tick songs they would like to download and when they click download a .zip is compiled dynamically and their download arrives as a single file. This is especially useful for record labels that may have a large discography where customers buy 1 album from one artists, 3 tracks from another artists & 2 tracks from another artist. This is differently a secondary concern but to throw something else into the mix, lots of labels and artists now release there music in 2 or 3 three digital formats (MP3 192kbps & 320kbps, WAV) So it would be good to add the option to buy albums or single tracks in a specific format. In other custom made download stores this has been a drop down menu on individual products or as a drop down when you get to the checkout page asking what format you would like the entire order in. As this is a bit specialist i would see this being a paid add-on and would have no issue paying for it. If i am missing a easy way to do this that already exist please let us know as we have just started to get to grips with Woo Commerce and the Unsigned theme. We’ve recently released a Bulk Download extension to achieve this functionality. I am marketing expert, after several days study on your plugin of pre-order, memberships, and subscriptions, here are some ideas. 1.Firstly, if Pre-order is disabled, the countdown for release can still be displayed by Admin setting? —Variable Membership Priority: Customers with membership should have priority to make an order with one chance and periodical valid CAPTCHA related specific product without waiting for release countdown of opening sale, even with some discount. Although, for hungry marketing purpose, the CAPTCHA should be set for only one chance valid or optional for admin customizing. The difference of making order between membership and common Users is that we guarantee that the membership can make an order before release, but the common users can only make an order by subscription before release and waiting for availability to make an order, and once the products is out of stock, the webpage will show to the common users: “Sold out, please make subscription for next”. The most important meaning of subscriptions for store Admin is that he can know how manny products should be stocked in advance, and whether the pricing is right by subscription response from customers. —Subscription for notification(optional): Under countdown line of opening sales, there should be an SMS notification subscription(not email notification), so that we can inform customers X minutes in advance before countdown for release of opening sales , and the SMS API should be open to Admin so that it can be setting to flexibly suit for cell phone operators from different countries or area. --Subscription or booking for next time release: If the customer miss the opportunity to buy this time, there will show "product sold", and customer can make a subscription for next time by one click. -- Only the customers who made a subscription can make an order or click the button of "Add to cart" next time once availability. --Pre-oder: For common users, during the countdown for release, they have an chance to make an pre-order by free, X percent of the price, or full price optional settings for Admin custom choice, but they have to waiting for longtime before availability. In General, there should be several button displayed: countdown for availability, Membership CAPTCHA, Subscription for next making an order once out to stock, Pre-order. Maybe I misunderstand your plugins document description, can we do as the above even by mixture using your several plugins now( even no SMS CAPTCHA and SMS notification is ok) ? if yes, please let me know, thanks a lot. As a customer i it would be nice if i could quickly switch between calendars for each bookable product. From a woocommerce point of view, it makes sense to list all bookable products on seperate pages. the calendar for bookable products is on the single product page, this isnt very intuitive for customers. 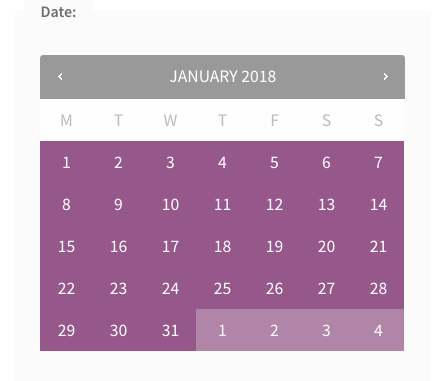 So it would be nice if there was a shortcode for woocommerce or bookings that would output the product image, the price, a calendar/date picker and time selector and finally an add to cart button, but also have a dropdown menu to allow the customer to select a bookable product so that the correct calendar with the correct times and dates shows. for instance at a movie theater, you might have 1 movie with session times like this: 12pm, 2pm, 4p, and another movie session with times like this: 1p, 3pm, 5pm. In this instance global availability wont work, and availability must be set at product level. And for these two products the calendars are on separate pages. 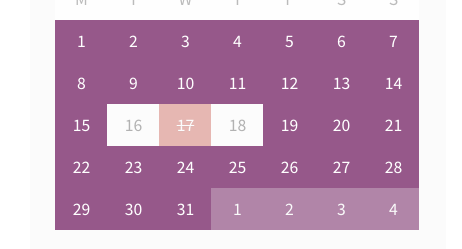 some how we need to put a calendar for all bookable products on 1 page, and having it in a shortcode would be amazing. The standard product page for a bookable product is good, it would be great if there was a shortcode that would allow me to have a form that would allow the customer to select the bookable product they want, which would display that products calendar and available times as it does on a single product page. First, when creating variations of a product, price should be optional. Not every variation needs a separate price; selecting the base or parent price should be an option. This would also make it easy to quickly modify a variable price from the parent price. Maybe we need to add an extra $2 to a variable to cover the difference in time/material/etc. At my work, we sell covers for changing pads. We have two sizes, and a variety of colors. There is no price difference between size and color, but I still build variations so that each has an appropriate picture and SKU. If we decide to change the product price, I now have to modify it for each variation. It could be very time-consuming and tedious. It would be nice to just be able to select the base product price instead of having to put in an individual price. My second idea is for some shortcode to add a dropdown list and Add to Cart button (or something) for variable products. Anything we can do to cut down on clicks before the purchase is completed helps. Many customers don't want to visit the product page in order to add it to their cart, so it would be nice to make it so that they can easily add their preferred variation of a product to the cart from any page I mention that product on. For example, on a page showcasing our changing pad, it would be nice to list our pad cover options, let the customer select the color and size they want, and add it to their cart while still on the changing pad page. The subscriptions plugin is great, but in my opinion, by making subscriptions a separate type of product, it is architected in a way that conflates two different concepts: The recording of stock / inventory and the method of purchase. Let me explain: On my website, I would like for my customers to be able to by 12-packs of protein bars either by subscription, or on a one-time basis. In either case, it will draw from the same inventory. I don't want to have to artificially create two "products" with different SKUs, and thus segment my inventory into two "piles" - one reserved for subscription customers and one reserved for all other customers. It would require me to do additional forecasting for no reason, and possibly stock out of one product while the other remains in stock - even though they are actually the same underlying physical product! In an attempt to remedy this, I've tried creating a variable subscription product, and adding a "one time" product as a variant which is billed "for one day" "once". But this still displays the price followed by "for one day" in the shopping cart, which is very confusing to customers. It also still forces a user to click a button that says "Sign Up Now" when adding the product to their cart, as opposed to "Add to Cart". Taken together, this wording is confusing enough that it will create a customer service hassle that is not worth the risk. Bottom line, the combination of the subscriptions extension and woocommerce, as currently designed, doesn't let me keep accurate stock counts for a product that I want to sell via two methods. In my opinion, the method of selling should not be conflated with the method of stock keeping. An Ecommerce theme targeted to Photographers that deal with mass amounts of images. This theme would require a few specialized features. First a way to mass upload images with proper category information and have each image become a product. This is use full for event photographers that take thousands of images in a day and need to put them up for sale. The second requirement is variations. A page where you can select the print sizes and specify prices, such as 8x10 for $20, 5x7 for $15 13x19 for 35 and so forth. When the images are added as products the price options are automatically included. as for uploading the images with categories that could be handled with a folder structure inside a zip file. Inside the Zip the folder structure would look something like this. The File name of the images ca be used for the product name. After this folder structure is created. The user can login to his wordpress Woo commerce theme. Under the products menu there will be a mass product add option. It would look similar to that of the normal product upload. You use a file browser similar to adding images, however it lets you pick the folder structure for upload. Each picture in the folders well be turned in to its own product, When this process is complete. The real power is that the system will read the folder hierarchy and assign Product Categories based on the names of the folders to the images in the file path. It would also have to be smart enough to know if a category already exists and not recreate it with a new ID. This would allow for easy search ability and indexing on the front end. Another major part is the price options. Since these would be Photographs for print. A product description could be added and the system would include it on all the new products being added. This would llow a little text "Image from the Toronto Tyke Championships 2012"
The same would be for tags to help with searching. Once all the information has been added the publish button can be pressed and the system uploads all the images. created the categories, adds pricing info and posts the products. this would be a very versatile system as it could be tailored to any event and the only major differences would be how deep the folder system would go and the names of the folders. With a few extensions such as cloud zoom, and possibly one that displays products more like a gallery with quick navigation. You have a system that allows photographers the ease of uploading many images at once. The Mass upload could be an extension that is sold separately and targeted at Photographers or its own theme. When you have a bookable slot, you can buffer after that slot by a defined range. For example, I have hourly slots, and I can then choose hourly buffer periods after each of them. If I have slots from 7am - 12pm - that means I'd have 6 slots. > By default buffer period applies forward into the future of a booking. Enabling this option will apply adjacently (before and after Bookings). That's because you have 2 buffer slots between each slot now. I didn't want 2 buffer slots, I just wanted to make sure that there was buffering before and after. We've had ongoing discussions on how Buffer Periods should work in https://github.com/woocommerce/woocommerce-bookings/issues/959 and in https://github.com/woocommerce/woocommerce-bookings/issues/1444 and it seems like the consensus is that Buffering should be either Dynamic or Preset. In other words, you get to pick if your buffering happens before anyone makes a Booking, or if the buffering is applied after Bookings are made. Right now we are tracking this as an enhancement... but read on for more juicy details. And I then book `9am` - by default, the Dynamic Buffering would only move forward and make `10am` unbookable. However, if you had Adjacent Buffering checked, it would help you set a buffer in both directions. This makes sense in this context. In the current context that we have, Adjacent Buffering makes no sense because it adds extra buffering periods without looking at already existing buffering periods there, so it doubles the buffering basically. If you take a look at how Buffering works in a Days context, it gets weird. 1. For now, we should remove Adjacent buffering when it's bookable by the Hour. It doesn't make any sense in how it currently works. 2. If we have Dynamic Buffering for days, we should also have Dynamic Buffering for Hours, and make it the default. 3. We should remove preset buffering entirely - that's what Availability rules are for. I don't think users would use preset buffers because they can just say "2 hour periods" instead of buffering rules that can be flaky. I can't think of a use for this but I'm open to hearing if others can think of one. 4. When we add Dynamic Buffering for Hours as well, we should bring back Adjacent Buffering for hours only in that context. Also, I tagged this as a bug and enhancement, which I think is confusing but also accurate ???? I'd rather have Google Tag Manager instead of my current Canvas > Theme Options > General Settings > Tracking Code. Google Tag Manager asks "Paste this snippet into your website template page so that it appears immediately after the opening <body> tag." It would be great to see the option to mark certain custom Product Attributes as mandatory. This would ensure that a site's support staff always complete the key data for each product, and don't accidentally miss data that may be required for filters etc. A google/ical like calendar booking UI on the front end. So instead of picking from a list of products the user can click on the date/time slot they want and then edit the options in a modal pop up before hitting save/book/confirm and then going to payment. I can’t see a demo so maybe this is already an option. If not it would make a nice add-on. Even better if you can have some admin control of how busy times/taken slots are displayed on the calendar. 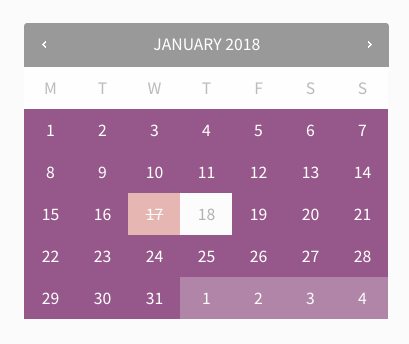 In the backend you could have a custom label option so the admin could display the text they want for already booked slots: for a business you might want the label to read "busy" or "booked"; for a club or other group you might want to display wordpress usernames of the users who have made bookings. Then you could have checkbox options to show the time slot and or product variable information. It would be really useful if we could limit a coupon so that it can only be used if the user is a new customer. For example, in our store, we are implementing a refer a friend system where an existing customer can refer a friend to us, then both of them get a discount. The discount should only be given if the referred customer is new to us. This could be achieved by establishing if the user has made any previous purchases. If they are not logged in it would be useful to then check if any orders have been made from the billing email address they have given upon checking out to make sure that they definitely are a new customer (as far as possible to check). This is an absolute needed feature ! We could export "in process" orders to CSV or other standardized formats. This would allow to print labels from USPS, UPS, La Poste, DHL and many others as they all have import features to avoid overwriting again and again customers data. This is not a fancy feature ! If you want to make the best online shopping product, this is a MUST ADD feature as you spend days and days sending boxes when you're running an online store ! EVERY other major online e-commerce does have this feature. So Colissimo: choosing among five delivery solutions and a wide network throughout metropolitan France for all your online orders. It would be very useful to have additional features added to the existing Canada Post Shipping Calculator Plugin. 1. Auto generation of Canada Post Order based on the shipping info that customers provide during checkout process. 2. Shipping label generation within woocommerce site. 3. Shipping info and tracking number where applicable sent from within the woocommerce site. Hope these features can be developed as it would make woocommerce integrate with this method of shipping in a streamlined manner. Want to add an option to pagination and/or category filter to "View All" products. Many people like myself hate, hate, hate clicking page after page after page - I just want them all on one page and I am willing to wait for it to load as it's better than waiting for every pagination page to load. Integration with the popular linnworks software would make it easy to manage stock across eBay, Amazon & a woocommerce store. One-Way sync to Office365/Outlook (iCal?) of bookings. it would be really useful be able to integrate the bookings calendar with our Office365, using the webcal .ics integrations in Office365. refreshed either on demand, or on a set time refresh. Only needs to be one-way read from WooCommerce. Each attribute used for a variation has a value, so does the base product. When creating all variations, its them a manual task to calculate with a calculator the variation price then add to the sale price. It would be far easier if an attribute differential price could be set, then this used to calculate the variation price with link all variations. It is currently a maintenance nightmare. This method could also be used to easily update prices, if for example only one element of the price changes such a the price of one attribute. Users cannot add-to-cart variable products from the category pages. They're forced to go to individual product pages to do so. Many other stores already offer that option. It's a much needed addition.